Terrie is a wife, mother and grandmother. She loves to Share her passion of traveling to interesting places & photography with others. 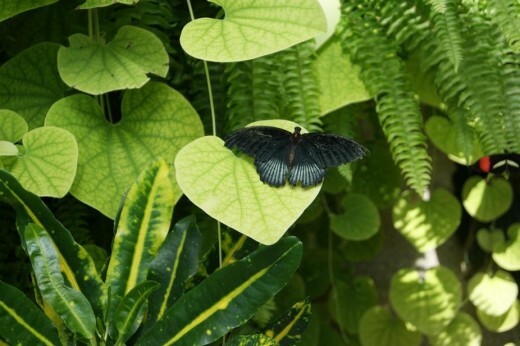 The surrounding vegetation is vital to the butterflies wellness. The Garden and Conservatory has everything butterflies need, to not only sustain life. But to also ensure they continue to reproduce. This Butterfly Exhibit does just that and then some. The pond photo below, shows all the natural plants, vegetation, and water needed, along with an incredible variety of flowering shrubs, plants and flowers. 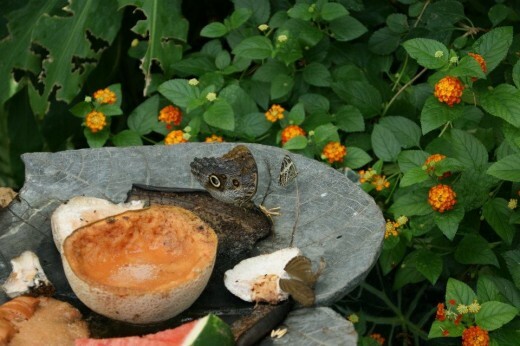 The butterflies are also provided, with a bowl full of fresh fruit. As you walk around, there are little markers everywhere, informing you of every type of butterflies in the exhibit. Along with the kind of habitat needed to help them thrive. What a beautiful, amazing butterfly home. The pond in the butterfly exhibit How many butterflies can you find. Bring layers of clothing, weather can change quick. Remember your hat, sunscreen in the summer months. What you will learn in the Butterfly Exhibit! Want to be amazed. Watch your children gaze in awe and excitement. The joy this place brings is contagious. The butterfly exhibit at the Calgary Zoo is an educational experience, without knowing you're learning. It will have your children talking for days. When you step inside, it feels like an oasis, in the middle of the city. That is why I want to tell everyone. You must go here! If, you want to know how butterflies, are formed. And see them emerge from their Chrysalis. See the incredible variety of butterfly color around you. Let the children see this wonder of nature up close and personal. Learn what they eat by watching them, not by reading it in a book. Gain knowledge of what plants attract them. If you stand still, they will even land on you. If you or your family, love butterflies the way we do, you must go here. Butterflies, Butterflies, are everywhere. But please remember, look but do not touch them. It damages their wings. There is a Buttterfly Exhibit in Calgary Alberta. There are many different kinds of butterflies. A lot of them can be found, at this amazing exhibit. They are here at the Conservatory and Gardens, from spring till fall. Above is just a few of the butterflies, I took lots of pictures. A wall of glass gives you a glimpse into the different stages that a butterfly goes through before it emerges into the world. Within five to 10 minutes, they go from a chrysalis to a full-sized butterfly. In the display were at least 50 butterflies about to emerge and more than six who had just emerged. What a site to see! 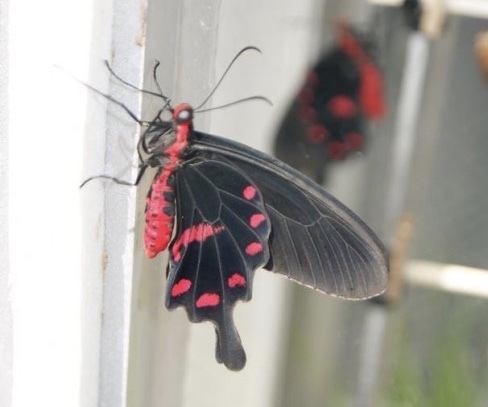 The black and red butterfly in the one photo had just emerged from its chrysalis. If you're lucky, transformation takes place right before your eyes. The butterflies don't start out here. It is only part of the butterflies life cycle. The butterflies start their lives on cooperative Butterflies farms. Thousands of kilometers away in places like Costa Rica. Walking around this Exhibit is intoxicating. From the fragrant lilac bushes to the butterfly bushes, flower aroma, and plant nectar. Something new lies around every corner, butterflies of all kinds. It's like a coloring book of artistic talent everywhere you look. The air is warm, humidity is high, and the blooms are bright. Butterflies are found, on every continent- except Antarctica. 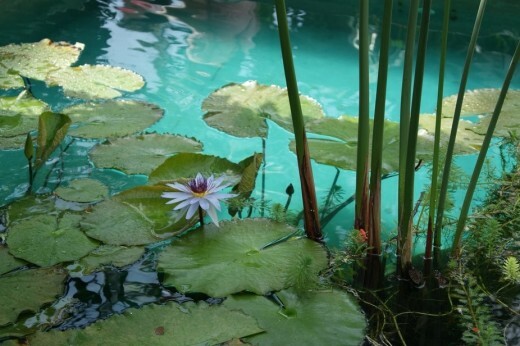 Habitat: Sunny areas with water, larvae host plants, and nectar plants. 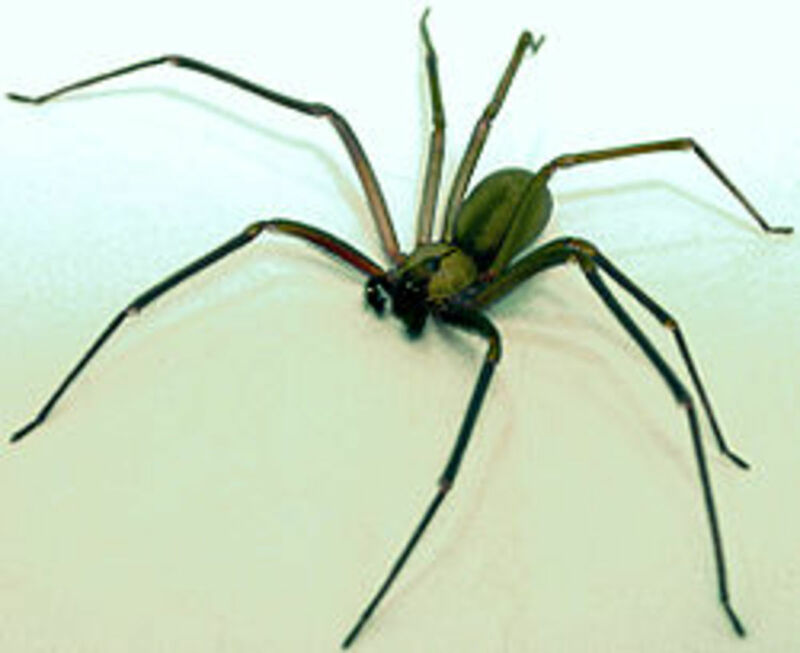 Diet: Flower nectar, pollen, juice of rotting fruit, bird droppings, carrion or animal sweat. Beautiful Butterflies spread your wings. Fly up in the sky where angels sing. Beautiful Butterflies, please land on me. For your luck is what I need. Beautiful Butterflies, fly and be free. There are between 18,000 and 20,000 butterfly species in the world. There are many things to see at the zoo. The highlight for us was the butterflies. There is also penguins, reptiles, tigers, flamingos and exotic birds. There are maps all over to guide you to different areas of the zoo. They are open every day. From 9:00 to 4:45, which is the last entry. 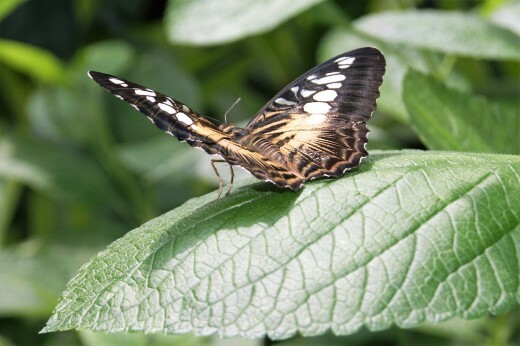 The Butterfly Exhibit can be found, in the Enmax Conservatory. You will also find a Gift Shop, Restaurant, and a Reader Rock Garden. Food bowl for the butterflies. Yum, fresh fruit and water. 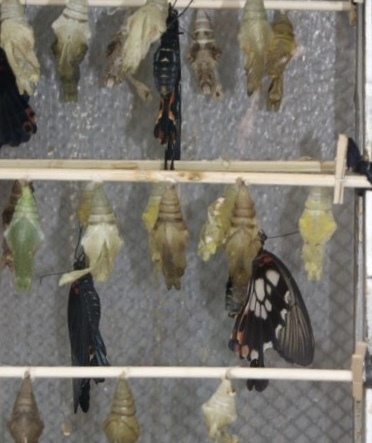 After seeing this Exhibit, you'll want to make a place for the butterflies at your home. If you do here is some of the things we did, to attract and feed them in the summer. We put out a bird bath with pieces of fruit and a small amount water. You will need to put a few small rocks in the water for them to land on and drink the water. They like melon best. We used watermelon, honeydew, and cantaloupe. Along with a small amount of water. We also planted flowers and small shrubs, that will attract them to our garden. Like butterfly bush, lilacs, petunia, honeysuckle and beebalm. You will need to find flowers and plants that grow where you live. They also love hibiscus flowers. You can also build a butterfly house if you want to give them a home. Children love to watch the butterflies, what better way than to create one at home. You don't have to make it yourself, a lot of stores have them. Make your own butterfly home from this kit and enjoy the life of the butterfly. Come to Calgary, Alberta and see them yourself. Calgary, one of the most beautiful cities in Alberta. Even though it's not the capital of Alberta, a lot of people think it should be. With a population of 1,200,000. Calgary is the largest city in Alberta and is found, on the bow river. 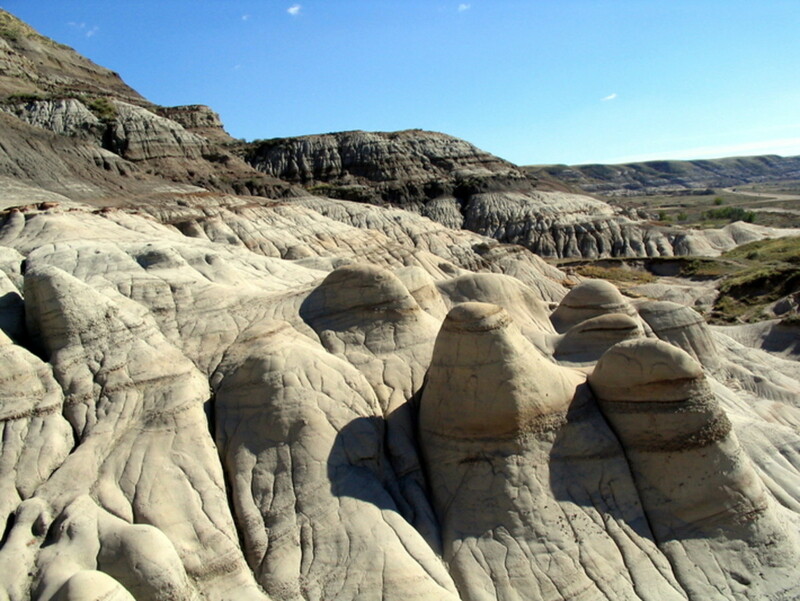 It is also the home of the famous Calgary Stampede, Olympic Park, and Calaway Amusement Park. If you want an indoor activity, check out the Flying Squirrel, LOL. It's a jump park, and the children will love it. I do suggest that if you're not used, to driving around the city, you should take a cab. It gives you the chance to look around and take it all in. This city has lots of twists and turns, over and underpasses. Now let the tourist in you take over and come on down to Calgary, Alberta. All information was researched using these sources. Butterfly statistics, Wikipedia and the online info at Calgary Zoo website. 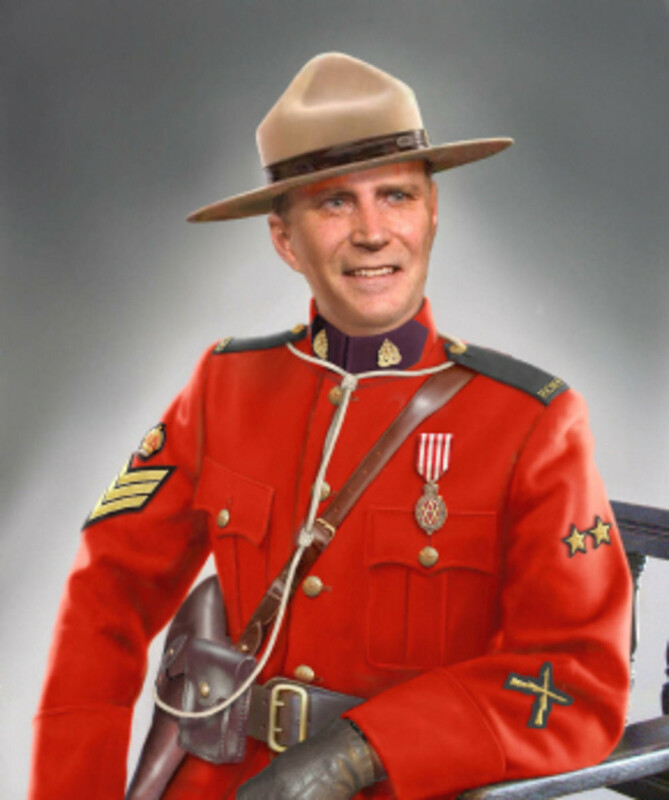 Info on Calgary was taken, from the Calgary Home Page. Other info came from my experience at the Butterfly Exhibit. Including the brochure at the Exhibit. Info was also gathered, via the google search browser for additional information. Just type in, tourism in Calgary Alberta. If you would like to know more check out any of these resources, they are a wealth of information. Including in the Calgary Tourism Web Site. Yes Nancy. It's a beautiful place. We stay at the camp grounds when we are there. Lots of amazing things to see. Thank you for commenting. Very nice write up here! I did not know there was a butterfly museum in Calgary. Friends have gone there, and say the parks are beautiful.